The 45 rpm single, the hard, black centrepiece of the teenage revolution,........ Just the look of a 1957 single on the London label with gold lettering, or the angles and DIY smudges of a 1979 Rough Trade release can raise the pulse, cause feelings of nostalgia, pride, envy....... The 45 is easy to love. A simplified version of this page is available as a video here. Recording needle-drops of 45 RPM records is more than simply about nostalgia too. The format was separate from the LP and many singles have mixes and versions of songs on 45s which were different, or not available at all, on albums. Many of these are interesting and collectable. Classic 45's website is owned by Leland Scott, an avid 45 collector for over 40 years. He makes the following, most persuasive point about the importance of the 7-inch 45 RPM record. There's so much more music available on 45! Of all the recording artists from the 1950s-70s who released music in any vinyl format, the percentage who released LPs is small compared with those who released 45s only. Most record companies, especially small independent labels, would take a bet on an artist by pressing a 45 record, or perhaps several, but unless one of them became a hit, that music never got them an LP contract. ...... In a rough count one can conclude that only 40% of recording artists ever released an LP.... Considering that "Rockin' Records" contains 68,841 artists .., this calculation means that more than 40,000 of them never made an LP. And I guarantee you that of those 40,000 artists, a large number made music that's actually worth collecting. But you'll never find it on an LP. RCA Victor introduced the 45 RPM record in March 1949 and, for a period, RCA's "45" was in competition with Columbia's LP. But a separate market soon developed for the RCA invention because, whilst the LP record invigorated classical music sales and collections of songs from popular artists, there remained the need to re-invent a medium for the single, three-minute song which had been for so long the province of the "78". 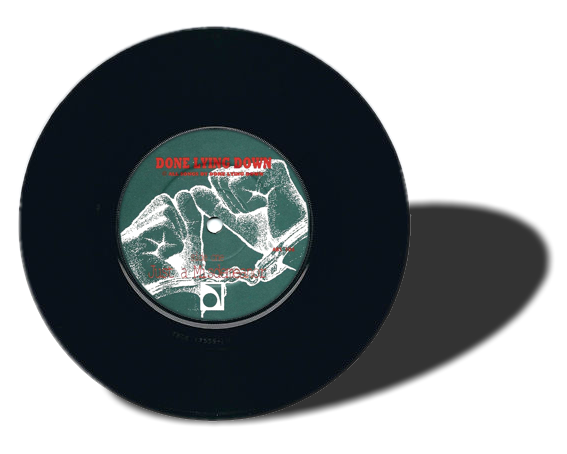 The plastic 45 RPM single is manufactured in PVC (vinyl), or more rarely, in cheaper and more brittle polystyrene. The first 7" records were monaural, but by 1971, almost all 45 RPM records were produced in stereo. From a design point of view, tangential (linear) velocity of a 45 at the outermost groove is high - nearly as high as the outermost groove of an LP. And the ratio of tangential velocity from the outermost groove to the innermost groove is 1.5 to 1 which means the quality is more consistent during the side than an LP, which has a ratio of 2.4 to 1. The disc material is (more often than not) vinyl and both the LP and single have similar groove geometries. So there is no technical reason why a 45 should not sound like an LP. But they don't sound the same ..... at all. If anything, the 45 RPM single has a reputation as a rather low-quality medium. Is this undeserved? The diminutive, 7-inch single does not fare so well when played on a turntable meant for 12" LPs. RCA originally envisged small 7" players for the format (like the one illustrated above). RIAA standards stipulate that the minimum music-groove diameter of a 7-inch, 45 RPM record is 108mm against the 120.6mm of the LP. A tonearm set-up to give the best tracking for larger LPs will therefore often be misaligned for a groove so close to the centre spindle. Clearly this can be allowed for. One worthwhile precaution, if the tonearn allows for SME-type replaceable headshells, is to have two headshells: one set-up for LPs and the other for 45s. And whilst you're doing that...... why not scour on-line auction sites for a classic ceramic-cartridge for 45s and fit that? A Sonotone 9TA-HC perhaps, or a Connoisseur SCU 1, or a B.S.R. SC5M? The problem with using RIAA equalisation for needle-drops of 45s is that these discs were not designed to be electrically equalised. Instead, they were designed to be played with ceramic cartridges which "automatically" equalised the RIAA recording characteristic. Most cheaper record decks right up to the end of the 45 era included ceramic cartridges because no equalising phono-preamplifier was necessary. The explanation for this seemingly magic trick is that a ceramic cartridge produces a signal proportional to displacement (not velocity, as in an electromagnetic cartridge) and it delivers a flat response to a constant-amplitude cut without requiring equalisation; albeit that the treble range is at a lower amplitude than the bass when RIAA equalisation is employed, see graph. The approach employed to equalise the bass and treble frequency portions of the frequency response in practical ceramic cartridges is to arrange a wide, shallow HF mechanical resonance, so that the treble section is returned to the correct level. It is this resonance which supplies so much of the musical character of the ceramic cartridge. The success of this clever mechanical trick in the best cartridges is quite astonishing. 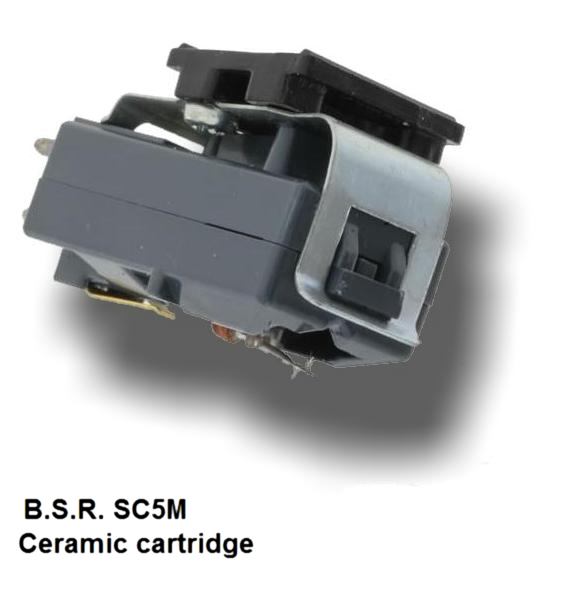 The frequency-response trace below is of a BSR SC5M ceramic cartridge. The designers achieved an admirably level response from 20Hz to about 7kHz after which the upper skirt of the resonance response falls. On a practical level, once the ceramic cartridge is bought and installed, there is the necessity to match this type of cartridge into a modern preamplifier (this is the case for the Groove Sleuth preamplifiers too). 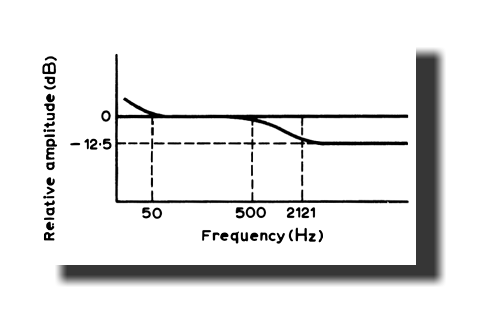 For, although the ceramic cartridge produces a displacement signal, it does so across a generator which is a pure capacitance (of about 500pF), which means that the following amplifier is required to have a very high input impedance (of more than 10MΩ) if it isn't to alter the frequency response. This is a very high-impedance indeed and wasn't often properly engineered even back in the days of valves (vacuum tubes). It is a requirement which is even more difficult and inconvenient to arrange today. The solution is to load the ceramic cartridge with a low impedance which differentiates the displacement signal; turning it into a velocity signal again. Then we use the displacement equalisation in Stereo Lab (EQ-S) to reconvert the response back to amplitude. Except that we can do even better than use EQ-S. Instead, we can compensate for the falling response of the ceramic cartridge above 7kHz because this is a bit "soft" for modern ears. This is the role of equalisation EQ-K in Stereo Lab. This equalisation modifies the falling response of EQ-S to complement the variation of the hardware circuit. That this modest extra complication is worthwhile is illustrated by the combined, overall frequency-response of cartridge, terminator and Stereo Lab EQ-K equalisation which is illustrated below. 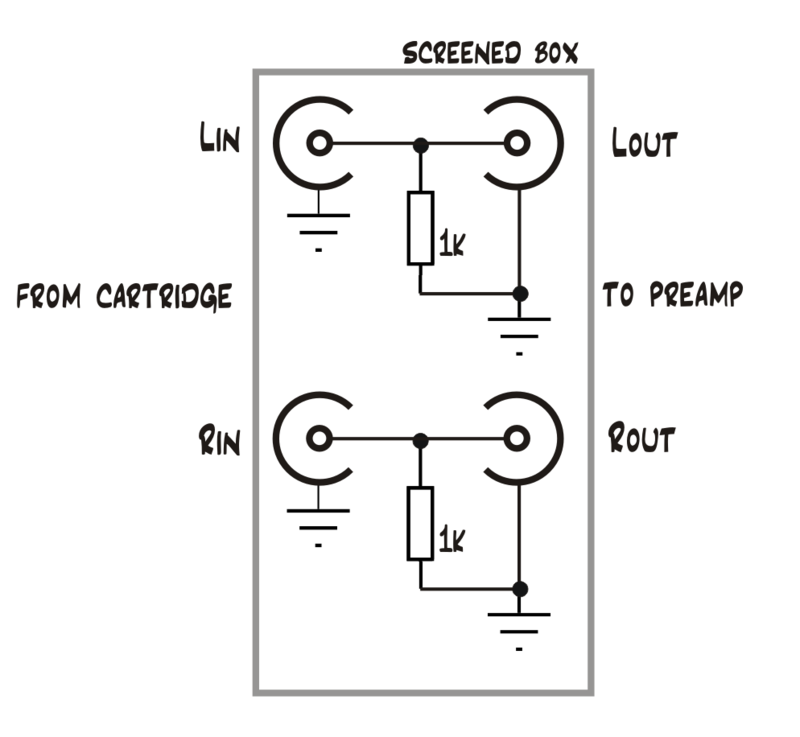 When this circuit is used, the cartridge ouput has property of a velocity-sensitive device. 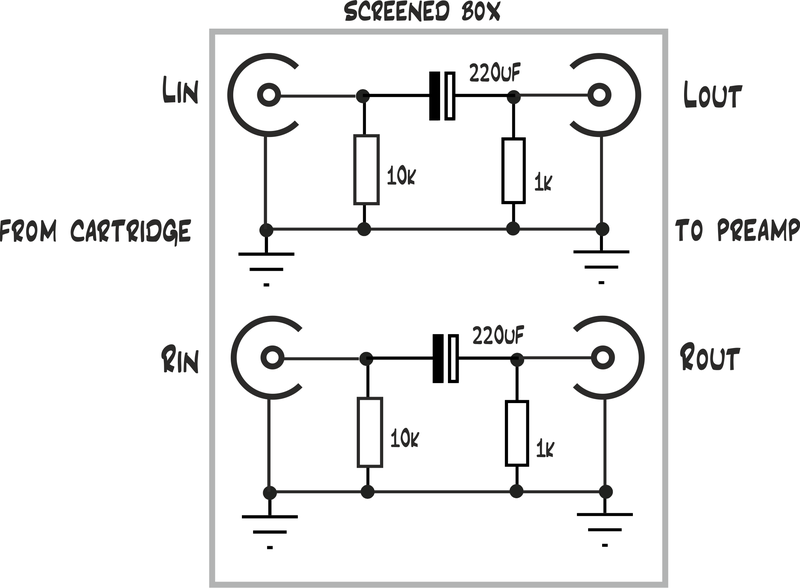 The choice of 1kΩ for the resistance is twofold: firstly, it is low enough that the entire audio bandwidth is differentiated; and secondly, because this load reduces the output-signal level of the ceramic cartridge to a similar level as that of the MM type. An example of how a ceramic-cartridge needle-drops can sound, listen to this file of a few seconds of various 45s found in our test-collection. In each case, the ceramic cartridge does a fantastic job of the bass and the bass-drum4, and the broad HF resonance flatters the generally over-modulated sound. 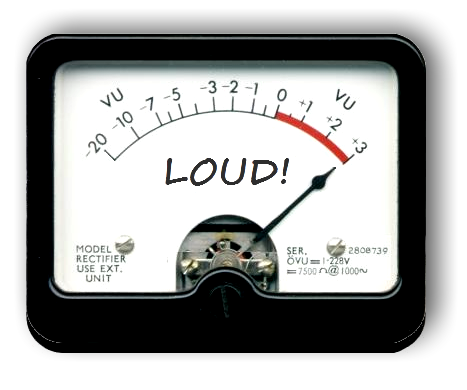 Measured distortion is lower than we imagined. We recorded 1% 2nd-harmonic and 0.25% 3rd on a 300Hz tone +12dB above standard recording level of 1cm/sec. Whilst it is entirely possible to arrange a set-up to rip 45s with a ceramic cartridge which does not suffer from any hum, it is the case that the displacement equalisation algorithm (or the variant EQ-K) does - in effect - give very high-gain at LF; much higher even that RIAA correction. Experimentation with the hum removal filter is therefore advised. The way to combine the virtues of an antique, ceramic cartridge with the virtues of a modern device is to use the innovative DisC displacement-sensitive cartridge. 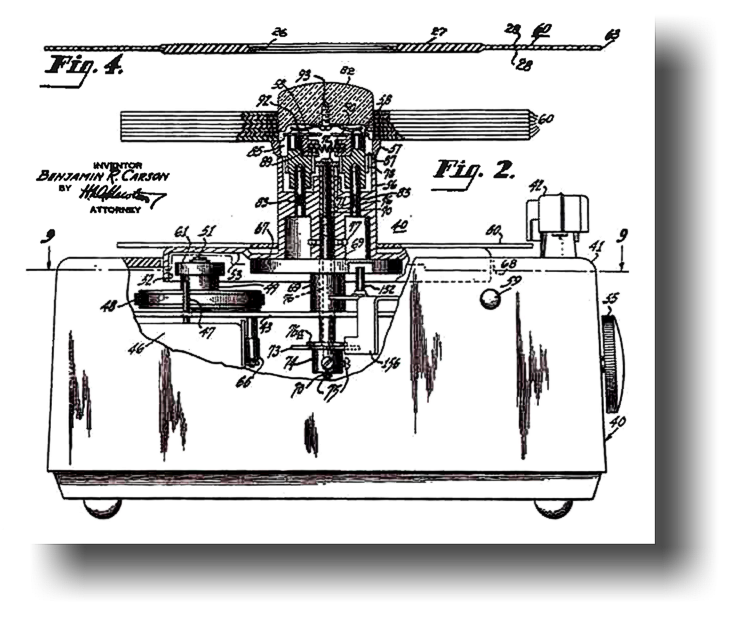 The virtues of displacement-sensitive phono cartridges are explained here. Ultimately, a large part of the poor reputation of 45s is because the single was a more portable, less cherished medium than the LP. Whilst the LPs spent quiet evenings at home, the 45s went out and partied! What's more, LPs wore sensible undergarments that your Grandma would have approved of, whilst 45s went to town in nothing more than a flimsy paper sleeve. 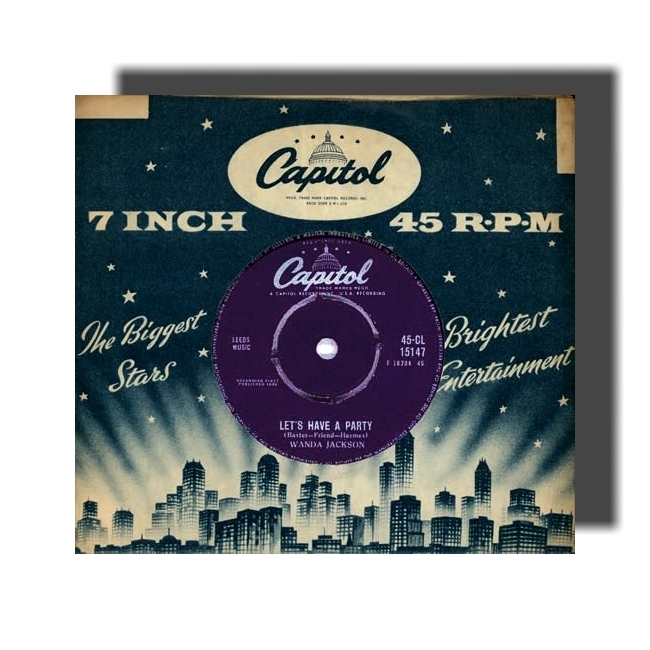 The poor performance of 45s compared with LPs of a similar vintage is therefore often due to rough, enthusiastic handing of this "hard, black centrepiece of the teenage revolution". And what's wrong with that? The imprint of fun as well as music in the grooves, is all part of the charm of this medium. 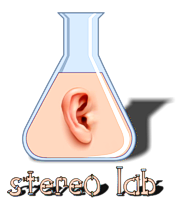 You will find with the right ceramic cartridge Stereo Lab will soon have your 45s sounding as you remember them. Ceramic cartridge equalisation is appropriate for 7-inch, 45 RPM records only. 12-inch singles (and 45 RPM LPs) should be treated as LPs. Polystyrene 45s were manufactured in an injection-moulding process rather than by "squashing" a biscuit of soft PVC plastic in between the two jaws of a press as is the case with PVC vinyl-records (a technique called compression-moulding). An injection-moulded, polystyrene 45 was manufactured by heating the plastic material until it liquified and squirting it into the closed stampers in the press. The labels were then glued on after the record left the mould; this latter process being the hallmark of this type of disc. The cost savings to the manufacturer came from the extended life of the stampers because they were not being heat-cycled. And the whole process could be completed more quickly and cheaply. Polystyrene discs seem to have been a largely American phenomenon: 45 discs elsewhere-else are almost always made of PVC vinyl. Technically, the surface of a polystyrene disc in good condition should be similar to a vinyl disc, but most collectors appear to prefer vinyl discs to polystyrene. The more rigid "feel" of 45 RPM records compared with LPs - even when manufactured from the same PVC material - is due to the thick cross-section of the disc in the centre; seen in Figure 4 of the original RCA patent (right). In order that this stacking process didn't trash the recording-surface of the records by having them touch each other, the central, label area of the 45 RPM record is moulded so that it is much thicker than the plastic annulus on which the grooves are moulded. The recording surfaces are thereby kept apart. Ceramic (or crystal) cartridges are based on piezoelectric principles. The word piezoelectricity means electricity resulting from pressure and that is exactly how these cartridges work. When a piezoelectric material is placed under mechanical stress, a shifting of the positive and negative charges within the crystal lattice takes place and this results in an external electrical field being generated. 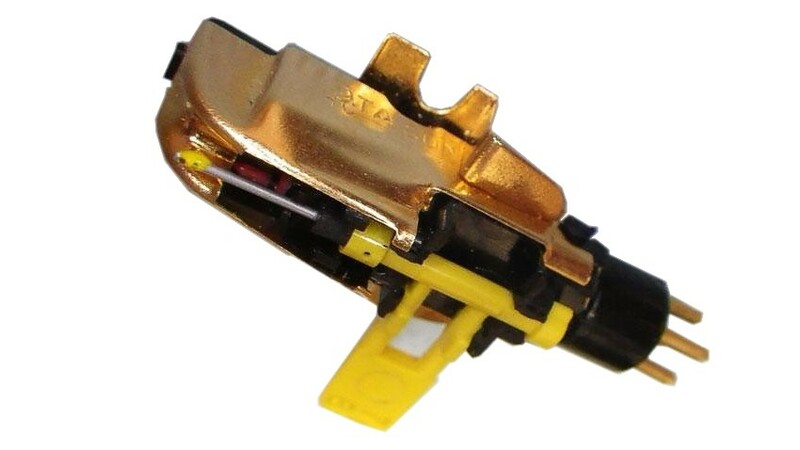 In a stereo piezoelectric phono cartridge, the stylus is arranged to bend two pieces of crystal or ceramic which display piezoelectricity and the external field is communicated to subsequent amplification by electrodes on the faces of the ceramic. Obviously, for such a field to develop across the material, it must be an insulator (or else the field would set up a current through it). Thus, the ceramic cartridge has an output impedance which is almost entirely capacitive. 2. Steve Knopper in Appetite for Self-Destruction: The Spectacular Crash of the Record Industry (Simon and Schuster. 2009) advances the theory that the discontinuation of the 45RPM single was the fundamental mistake made by the major record companies. Eliminating an inexpensive recording format for young fans to buy and love heralded file-sharing and the rest of the technologies that, within a very few years, undermined their businesses. 3. There is an urban myth that low electrical loads on a piezo-cartridge are reflected back to the stylus point and therefore cause a record to wear more quickly by - in effect - lowering the stylus compliance. This is untrue, the effciency of any phono cartridge is so low (less than 0.1%) that any reflected electrical load is infinitesimally small. Note that, if you use the PHLUX active phono cartridge, the slightly more complicated circuit (right) prevents the phantom supply from biasing the piezo element in the ceramic cartridge. "I just weeP at night" in the 1963 B-side of the number 1 single Bad to Me / I Call your Name by Billy J. Kramer and the Dakotas. 5. This is exactly the point: the ratio of legitimate recorded velocities to velocities due to damage is so different in a 45 RPM single compared with an LP that the statistical assumptions used in click and pop removal in Stereo Lab do not reliably suit this medium.